Typical turning between the tailstock and drive centres can be seen below. The wood to be turned, is held securely between the centres. A drive centre is used at the headstock side of the lathe (left). This rotates, powered by the motor. 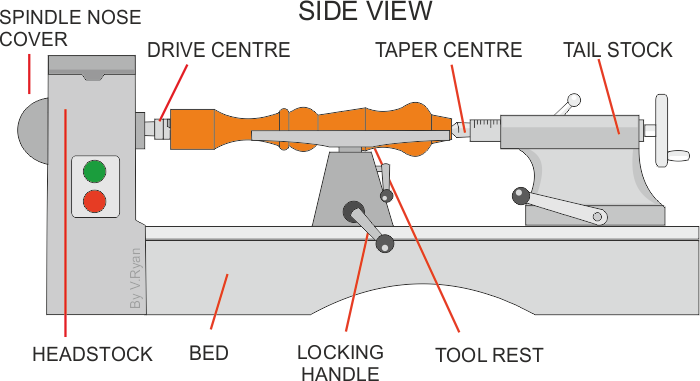 A dead centre or a live centre (preferred), is used at the tailstock side (right). Grease is applied to the ‘point’ of the dead centre and this allows the wood to rotate, as a dead centre does not rotate itself. A live centre revolves on its own set of bearings and does not require grease. All wood turning requires training by an instructor, as lathes can be extremely dangerous if misused. Small pieces of wood can be held in a three or four jaw chuck and turned. Only a small amount of material should protrude from the chuck. Long pieces of wood should not be set up in this way, as the wood will not be secure and will inevitably ‘fly’ out of the chuck, when contact is made with the gouge. Serious accidents can be the result.